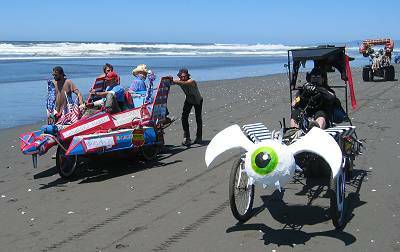 Having witnessed four Baltimore Kinetic races, we embarked on a cross-country pilgrimage to the Mecca of Kinetic Sculpture: Humboldt County on the North Coast of California. The North Coast is the closest you can ever get to Never Never Land, where children never grow old but continue their playful immaturity throughout life. And Humboldt County is almost as isolated as Never Never Land. Karen Wallace, Dave Hershberger, and I drove six hours north from Sacramento, where the Kinetic Homeland lurks among the redwood forests. Hobart Brown built the first kinetic sculpture in 1969, three full decades before the race came to Baltimore. The California race has grown longer, too--it's 38 miles over three days. 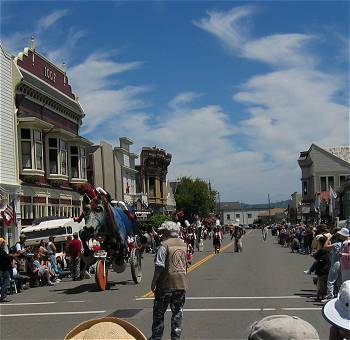 The race starts Saturday in Arcata, passes through Eureka, and to the finish line in Ferndale on Monday. The California race has also had three additional decades to develop--culturally and technologically--in its amazing isolated environment. Our first stop was one of the sort of places that takes root only after a pack of dedicated fanatics have been at something for several decades. 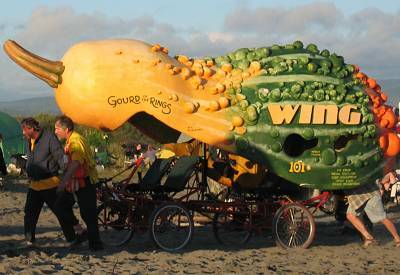 This photo shows one of the middle-earth weapons coming to defend its Gourd of the Rings at T minus 16 hours before launch; another photo of the gourd appears below. 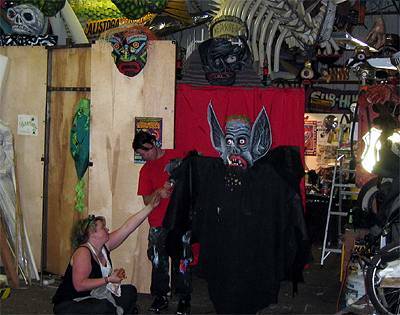 The Lab is operated by and for teams led by Ken Beidleman (Gourd of the Rings), Duane Flatmo (Bats in the Belfry), Calamity June Moxon (Sparkle), and Charlie and Mark Jordan (Caf-fiends). Every year they each construct amazing entries. 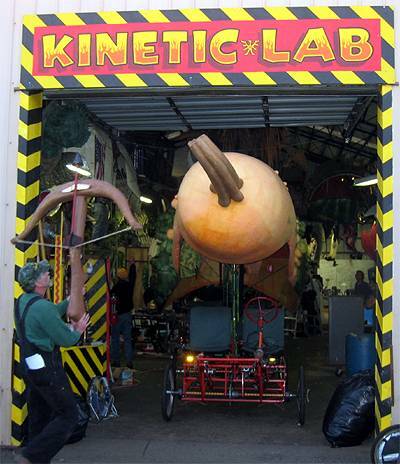 The Kinetic Lab is where many of the grandest and most fanciful sculptures are born. The night before the race, excitement is high and the racers--the term "Kinetinaut" hasn't arrived from Baltimore yet--scurry about applying finishing touches. Trophies are welded, sculptures are painted, drivetrains are tested. Everyone goes from place to place with clear purpose--except us. 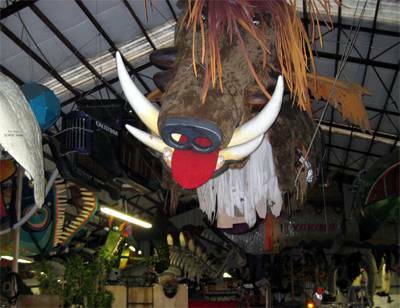 Our eyes are drawn not to the excitement on the floor, but up above, where sculptures from previous years hang as if in the attic of Jim Henson's imagination. The lab's rafters house fantastic sculptures from years gone by. An antique car, a boar, a fish, a dinosaur, a dragon, and if you look closely in the lower-right corner, you can just barely make out the dog featured on the AVAM homepage for the Baltimore Race. Most of the sculptures in the Lab's attic are missing their chassis, because the racers long ago recognized that, once you've got a vehicle that can ace the course, you can refit it with new art for the next year, and therefore make the art that much more spectacular. 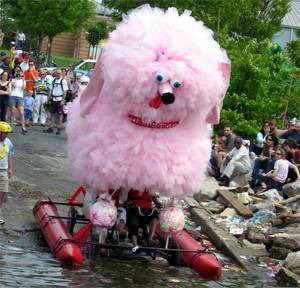 This recycling idea has begin to take root in Baltimore, too; the 2002 Bartmobile reappeared in 2003 as a volcano, and in 2004 as the Carver Coupe, and other Kinetinauts have stated their plans to reuse chassis with new art. 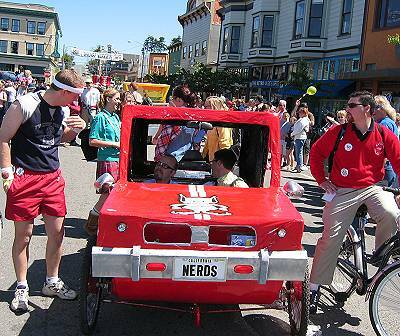 The Revenge of the Nerds designed their sculpture to look like an AMC Gremlin. The two jocks in the photo stole the car on the second day of the race, and the nerds stole it back on the third day. They won Racer's Choice Award, the huge electric trophy with the rotating chicken icon and glowing lights pictured at the bottom of the page. The race starts at noon, but things start to happen at 8am. A crew of volunteers meets with the police, including an introductory lesson in traffic control ("Don't think about the amount of traffic facing you. All you have to do is stop that first car and you've done your job.") A club of red-jacketed RV drivers shows up and sets up their folding chairs to form a front row, and--since this is the Pacific Northwest--a coffee truck starts serving some pretty fancy brew. By 11am, the Humboldt State University Marching Lumberjacks band has started playing, the KHUM radio announcers are going, and the safety check begins, right on schedule. Unlike in Baltimore, the brake tests are a crowd spectacle. Each sculpture is required to come to a vaguely abrupt stop, then the pilots must evacuate in short order (to prove that they won't go down with their sculpture if there's calamity at sea), and then the pilots are subjected to a comic sobriety check. Meanwhile, the radio announcers tell the crowd about each sculpture, and the Rutabaga Queen bestows her blessings on each sculpture. Just about every part of the race started exactly on time, which is amazing given the mayhem inherent to the event. This sculpture is Bats in the Belfry. They wore their costumes almost the entire time--even the masks--and the bat wings you can see on the roof of the sculpture had a separate gearing and chain system to propel their flapping. They won the Best Art Award, the Second to Last Award, and the Poor Pitiful Me Award. The race follows the beach for several miles, where the wet Pacific sand requires wide tires. 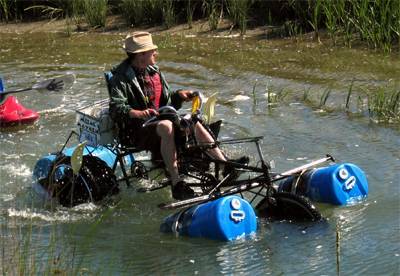 On the left is the Peace Peddler, with 42 gears and a front suspension, which won an Ace Award for following all the rules, even the difficult ones. In the foreground is the Evil Eye, which also won an Ace Award as well as the Third Place Engineering Award. 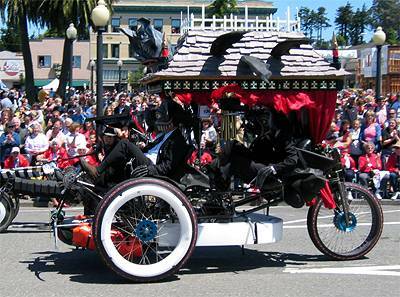 The captain of the Evil Eye was a Kinetic Groom at last year's race, married by Hobart to another race participant. To the right is That's A Mower, Eh?, which started life as a Honda riding mower with a 5-speed transaxle and 2x3x2 chain rings. Dead Man's Drop is an obstacle without compare in the Baltimore race. One at a time, the sculptures crash down a steep sand dune that's at the angle of repose and is so steep I'd be hesitant to take my mountain bike down it. It's quite a spectacle, and the crowd is large. One of the sculptures--not shown here--flipped over on Dead Man's Drop, and won the Golden Flipper Award. In this photo, the Axles of Evil are just starting down the slope. They gave out Get Out of Abu Grabe Free cards, and provided commentary about the state of American journalism with an "Embedded Journalist" on the roof, in a bed. If you have a broadband connection (or are very patient) see the movie of the world's only 4-seater amphibious gourd descending Dead Man's Drop! QuickTime and Media Player will display the short clip, but it's a 4.4MB download. 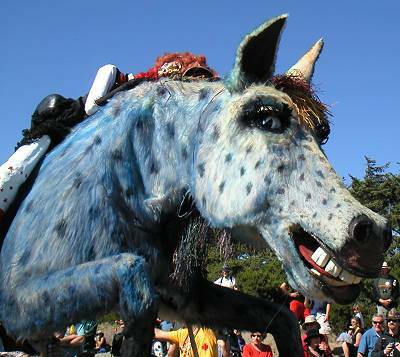 Sparkle is a long-time race veteran; this year she was a Blue Roan horse with a human-size Calamity June riding on top. The human June explained that the one on top didn't collapse from drunkenness, but instead was a horse whisperer. Sparkle won the 2nd Place Art Award, the Spectators' Choice Award, and for their fantastic costumes, the Best Pit Crew Award--you'll see their garb below. 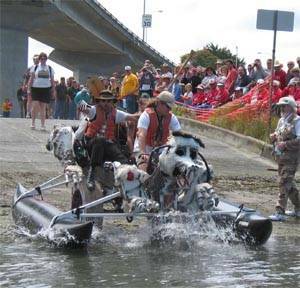 Sparkle has 216 gears, to carry her along the varying terrain of the racecourse, from grueling uphill loose sand to US Highway 101. 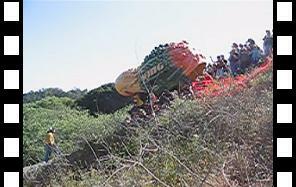 The UCSB Santa Barbarians have a splooshsome water entry on Sunday morning to start their few hours on the water. In real life, Henry Ford was an extremely industrious man ("industrious" meaning "workaholic"), with no time for anything as frivolous as surfing (and forget about Kinetic Sculpting). The creators of Henry Ford Goes Surfing sought to give the ghost of Henry Ford a day at the beach at last. The fiberglass Model A replica with stout tires is designed to tackle the course with no reconfigurations, and with independent powertrains for each driver has no single point of failure. With hat held high, they made a big splash. The Bikin' Fools built their entry using the body, tires, and transmission from an actual Subaru, and on the side of the car described it as "2630 pounds (fully loaded)." This photo was just after they earned the Biggest Splash Award; they also won Hobart's Founder's Choice Award. All the sculptures, including the heavy ones, sail two miles south and come out at a commercial boat ramp. This under-the-hood shot shows that the Bikin Fools removed the engine and firewall and created their own pedal-driven powertrain linked into the original transmission. 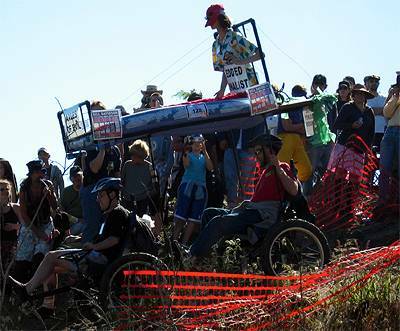 On Sunday night, all the sculptures head for Crab Park for a night of camping and festivity. Shown here is the incredible Gourd of the Rings in the light of the beach sunset. The mid-race festive break is a great time for all the pilots and crews to socialize. Many of the sculptures received sponsorship from Wing Inflatables, which provided well-built pontoons, a key factor in making the California sculptures worthy of miles-long sea voyages. 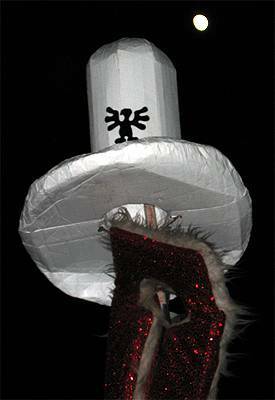 Late Saturday night, the moon rises behind a hat worn by a member of Sparkle's Hoss Hat Posse atop a sequined life preserver worn by one of her Rhinestone Cowgirl pilots. 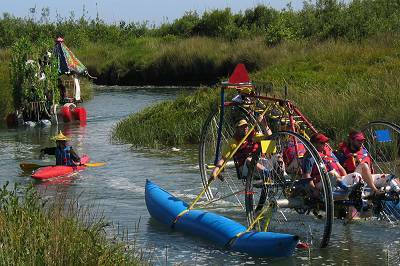 After crossing the Eel River as the tide comes in, the sculptures sail up the slough for 3/4 mile. Wet Paint is a fantastic tricycle with 80-inch wheels, the sculpture most likely to be hired by a movie crew if anyone tries to remake Willy Wonka or The Prisoner. They used Honda Civic disk brakes. In the background to the left is Pandamonium, two pandas paddling a twinkling pagoda and jangling bamboo garden. Pandamonium won the Best Engineering Award and an Ace Award, and at times of excitement the pit crew would do their special Panda Dance (that's one of them in the kayak). 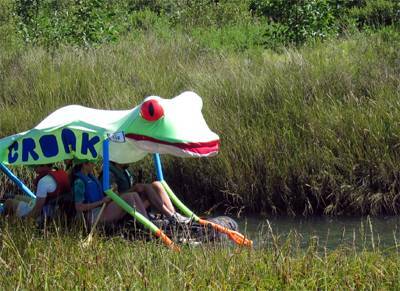 Green spandex formed the skin of the amphibious Croak, shown here making its way up the slough. Croak was the only sculpture not powered on land by rotating pedals, but instead used a leg-press action, and won the Third Place Art Award. 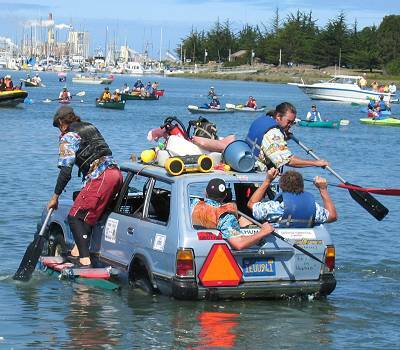 Every sculpture was powered on land by human quadriceps, although some switched to arm-powered oars on the water. Exiting the slough proved a challenge for almost every sculpture--but getting all wheels out of the water without assistance was a critical requirement to win an Ace Award. 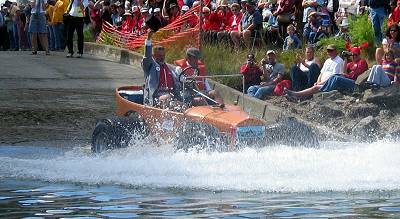 One successful engineering technique was a rear buoyancy tank consisting of a barrel with a valve at the bottom; that way when it came time to exit the water, Metal Mayhem gained traction by opening the valve and deliberately taking on water to lower the rear wheels into the riverbed, and simply drove out. 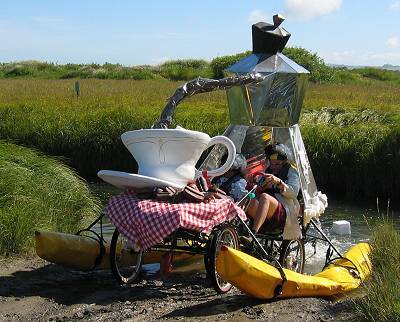 Another sculpture that successfully exited the water was the Kinetic Caf-Fiends, who not only won an Ace Award, but also the Grand Champion Award, combining art, speed, engineering, and Kinetic spirit. In Ferndale (population 1,379) at the race completion, thousands of people filled the streets while KHUM announcers broadcast the arrival of each sculpture, including Sparkle--you can see the huge Hoss hats of her posse in the background. Meanwhile, from his apartment above his gallery, race founder Hobart Brown looks down upon the proceedings in his tophat. Hobart is still a brilliant lunatic artist, but is no longer a young kinetic racer. Someday, he will no longer be present in the body to witness the spectacle, but his spirit will surely continue year after year as long as there are Kinetic Racers. 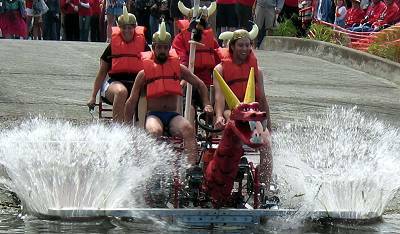 After the race, they have a big awards ceremony to celebrate the compound foolishness of the Kinetic Sculpture Race. (One advantage of a 3-day race is that folks aren't quite as exhausted as at the end of Baltimore's high-intensity 1-day melee.) 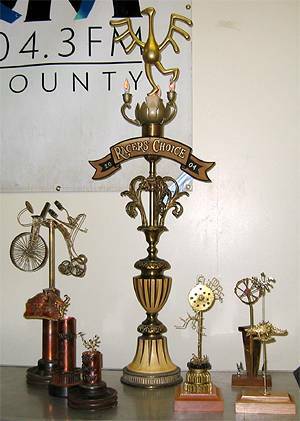 The trophies given at Monday's banquet are fabulous works of art unto themselves, and are built by Hobart and other local artists. The Racer's Choice--with rotating chicken icon above glowing orange flame bulbs--was awarded to the Nerds.